“Despicable Me 2,” which was released on Blu-ray and DVD combo pack on Dec. 10, 2013 from Universal Home Entertainment and is rated “PG,” also stars Benjamin Bratt, Miranda Cosgrove, Russell Brand, Ken Jeong, Steve Coogan, Kristen Schaal, Elsie Fisher, Dana Gaier, Moises Arias and Nasim Pedrad from directors Pierre Coffin and Chris Renaud and writers Cinco Paul and Ken Daurio. To win your free “Despicable Me 2” combo pack courtesy of HollywoodChicago.com, get interactive with our unique Hookup technology directly below. That’s it! The more social actions you complete below, the higher yours odds of winning! Completing these social actions only increases your odds of winning; this doesn’t intensify your competition or lower your odds! Note: Red-ribbon loyalty redemptions will not be accepted for this Hookup. Gru, his adorable girls and the mischievous Minions are back with a cast of unforgettable new characters in the blockbuster sequel to the worldwide phenomenon. Just as Gru has given up being super bad to be a super dad, the Anti-Villain League recruits him to track down a new criminal mastermind and save the world. Partnered with secret agent Lucy Wilde, Gru – along with the wildly unpredictable Minions – must figure out how to keep his cover while also keeping up with his duties as a father. Assemble the Minions for laugh-out-loud comedy! 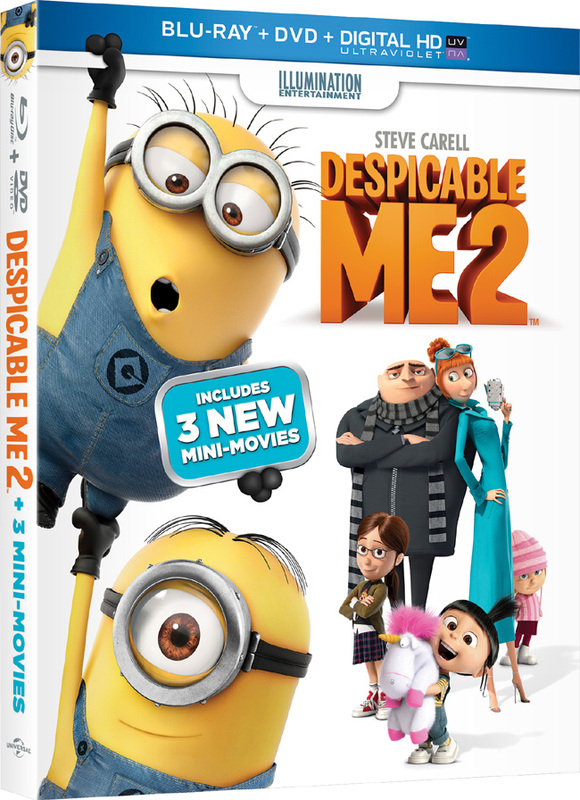 “Despicable Me 2” with Steve Carell and Kristen Wiig came to Blu-ray and DVD combo pack on Dec. 10, 2013. This HollywoodChicago.com Hookup is simple! Just get interactive in our unique Hookup technology above. We will award 5 free Blu-ray and DVD combo packs based on social entry numbers and/or randomly for our “Despicable Me 2” Hookup. Good luck!